As hard as windshield damage is to avoid, there are some things you can do to lessen the annual damage you receive. We've interviewed Danny Desanko of Crack Chip Repair in Sherwood Park for some tips on what to do when you get that inevitable chip in your glass! Tape it! Dry the area off and cover the chip with a piece of scotch tape to keep it dry and clean. If you have a crack, tape that too, but extend the tape 6" after the end of the crack. The sooner the repair is done the better the results. Chips and small cracks turn into large cracks very quickly so get it repaired as soon as possible. In cold weather avoid using defrost until your car is warm. Avoid underground parking in a heated garage in the winter. Driving up on curbed driveways twists and torques your car, so approach these slowly to aviod jarring the windshield. Glare from the crack can reduce visibility drastically. A cracked or weakened windshield may cause your airbag to deploy improperly. Structural integrity - your windshield actually helps support the roof of your car. A damaged windshield could actually cause problems in a rollover or front end collision. Once a crack starts it will continue to spread until it finds an edge. Do not follow cars and especially trucks too closely. 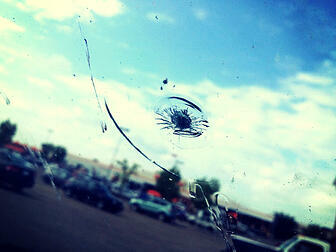 Once your windshield is damaged you have 3 choices: Repair, Replace or Do Nothing. If you do nothing your chip is almost certain to spread the length or height of the windshield. Repairing is clearly the less expensive route. A good rule of thumb is that as long as the structural integrity of your windshield has not been compromised the crack or chip can be fixed. Repaired cracks can be quite strong, but try and find someone that will put a money back guarantee on your repair. If your windshield has multiple cracks or cracks that extend to the edges you might want to look at having it replaced. If you do take this route Danny recommends that you ask that it be replaced with the original OEM windshield rather than OEM equivalent glass. Original glass can be quite a bit more expensive, but the quality differences are immense. Did you know that you can actually add auto glass insurance coverage to your car or truck whether your current policy has it or not. This coverage starts at around $186 / year and if you'd like to enquire about it, don't hesitate to give your local Armour Insurance agent a call at 1-855-475-0959. Thanks to Danny Desanko of Crack Chip Repair for all of the helpful information and photo he supplied for this article.